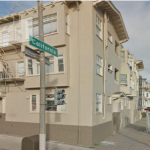 Great location in Laurel Heights & Presidio Heights. A block away from Laurel Village Shopping Center. Muni stop right in front of the building. The building includes 20 SRO units with shared kitchen, bathroom and laundry facilities. Bedroom: Contact to find out. Bathroom: Contact to find out.